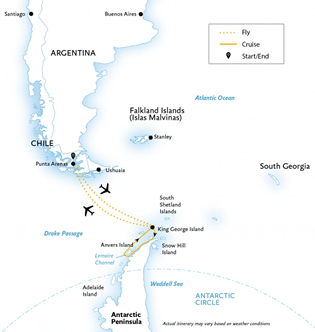 Experience the fastest, most direct way to Antarctica, flying over the Drake Passage. 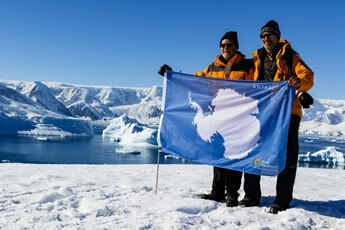 Explore King George Island and the Antarctic Peninsula! 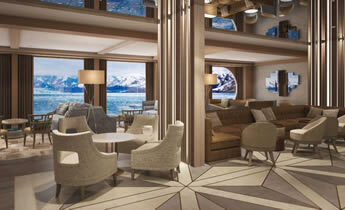 Distinct and comfortable, refined and roomy—these attributes and more describe World Explorer. The personal space on the World Explorer is exceptional. Every cabin has either a private walk-out or Juliet balcony for direct ocean views. 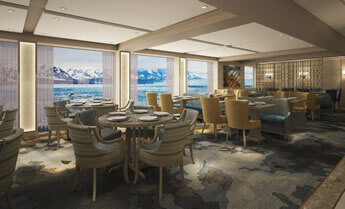 World Explorer also delivers plenty of public areas to unwind in after a day outdoors, including the glass-domed Observation Lounge for quiet contemplation and full skyline views, the Explorer Lounge for a drink and a chat, and the library for more intimate relaxing and reading. Presentations and discussions are facilitated in a dedicated lecture theater. Health and wellness facilities feature an outdoor running track, a small gym and a sauna, plus a spa with change rooms, showers and lockers. For the active adventurers, add-ons include kayaking, camping and stand-up paddle boarding. 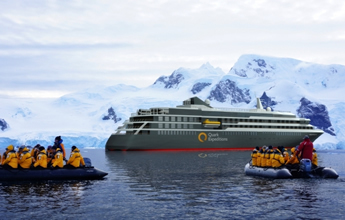 World Explorer will be an environmentally friendly polar expedition ship, incorporating advanced marine technology with a hybird propulsion fuel-efficient Rolls Royce Diesel Electric engine. All Quark voyages include an expedition parka to keep and a loan of appropriate polar footwear. 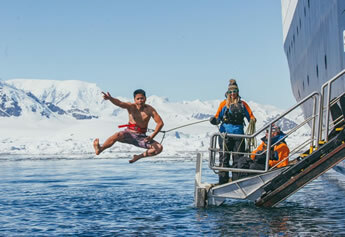 For shore landings you should plan to bring base layers (wool, synthetic or a blend); mid layer – warm fleece top and pants; wool and synthetic socks (3 – 4 pair); glove liners; neck warmer or balaclava; warm hat that covers the ears; waterproof pants; waterproof gloves; suncreen; sun glasses with UV protection. Other suggested items include: waterproof lightweight backpack or drysack; swimsuit for polar plunge; binoculars; camera with extra batteries; extra memory cards; sea sickness, indigestion, headache and other over the counter medications as well as prescriptions. For land and on board the World Explorer: comfortable, casual clothing (pants, jeans, shirts, sweaters and sweatshirts); lighter shirts in case the ship gets warm; comfortable non-slip, close toed, unheeled shoes; swimwear and gym clothes. If you’re planning to bring a serious camera we’d suggest you consider the following: telephoto and wide angle lens; extra batteries; polarizing filter to help with reflections off the water; tripod; waterproof camera bag; zip lock bags to protect the camera and lens from condensation; laptop to store/edit photos. The electrical current in Chile and on board is 220V. Guests should be sure to bring the appropriate converter for devices that are not dual voltage. The plug configuration on board the World Explorer and in Chili is type C (standard round two-pronged plug). Gratuities are customary expressions of appreciation for a job well done. It is our goal to ensure that the service you receive is as wonderful as the sites you visit. Gratuities have not been included in your program fare, and have not been added to your reservation. At your own discretion you may choose to provide tips at the end of the cruise. The comfort and safety of our guests is our first priority. Smoking is not permitted in the suites or enclosed, public areas on board the ship. Smoking will only be permitted in designated areas on open decks. Land properties will have designated smoking areas. 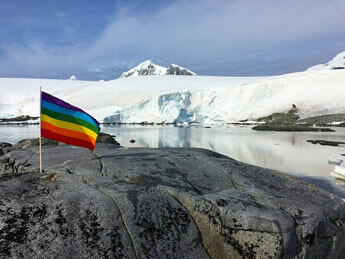 There are no required vaccination requirements for citizens of most countries entering Chile or Antarctica. However, we suggest each guest make an appointment with a Travel Medicine Specialist to discuss your individual needs and health concerns. An Emergency Evacuation insurance policy (maximum benefit of $500,000) is included in the rate. However, it does not provide coverage for cancellation, medical expenses, or baggage. 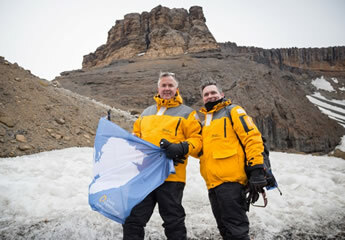 Quark Expeditions requires that all passengers provide proof of out of country medical insurance which must include a minimum USD $50,000 of emergency medical coverage and in addition, strongly recommends they purchase a comprehensive policy to cover themselves for cancellation and baggage. Each landing is different and is dependent on weather, but every day presents new sightings and photo opportunities, and it won’t be long before you can tell the difference between an Ade´lie, gentoo or chinstrap penguin. 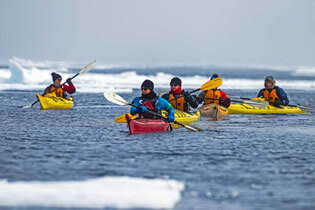 Be sure to check out the “Add Ons” for Sea Kayaking and Stand Up Paddle Boarding options. These optional excursions are very limited and are on a first come-first serve basis. 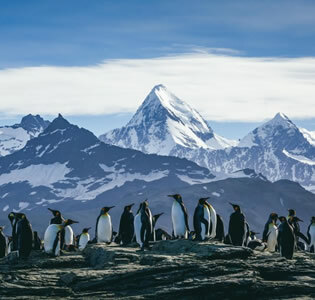 You should schedule your flights to arrive in Punta Arenas, Chile by 3:00pm February 9, 2020. The first scheduled activity will be a mandatory briefing dinner at 6:00pm. However, Quark reserves the right to send guests on the charter plane to King George Island this evening. This may happen when they see a weather system that could cause a delay on subsequent days. It is for this reason that we request all guests to arrive in Punta Arenas (PUQ) no later than 3:00pm on February 9th. You should plan to fly home from Punta Arenas, Chile on December 16th at anytime. 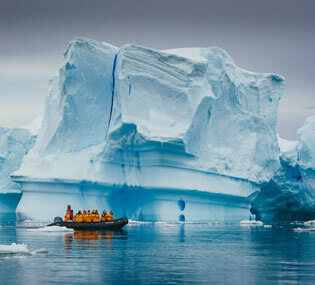 However, due to the weather dependency of this program, Quark Expeditions advises all clients to book changeable airlines tickets along with cancellation and interruption insurance to assist with additional airline change fees. We also advise all guests to have flexible travel arrangements upon disembarkation of the voyage if delays arise. Once you have booked your flights, please provide us with a copy of your flight itinerary so that we may arrange your pre and post airport transfers. The included charter flights to and from the cruise allow a maximum of 20kg (44lb) per person. If you bring additional luggage, you will be required to store it in Punta Arenas until after the cruise. A passport, which is valid for six months after your last date of travel, is required for this trip. No visas are required for US or Canadian citizens. Residents of other countries should check with the nearest consulate of each country visited on this itinerary. The culinary team on board the World Explorer will make every effort to accommodate special dietary requests. Please inform us at least 30 days prior to departure of these requests. Bank machines are widely available in Punta Arenas, Chile. The Chilean currency is the Chilean Peso and the US dollar and other currencies are not widely accepted. US dollars and credit cards are used on board the World Explorer. The Dreams Hotel in Punta Arenas offers free WiFi. The World Explorer offers satellite internet for an additional charge. 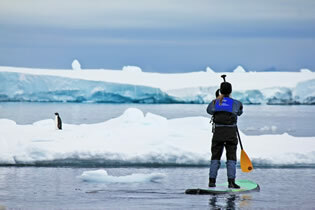 All shore excursions are led by expert guides and naturalists. 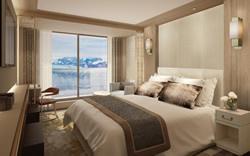 Approximately 334 square feet, one double or two single beds, on Deck 5. A 110 square foot walk-out balcony, separate sitting area with sofa, double closets, refrigerator, TV, state of the art “infotainment” system, and private bathroom with shower and double sinks. Approximately 278 square feet, one double or two single beds, on Deck 5. A 110 square foot walk-out balcony, separate sitting area with sofa, walk-in closet, refrigerator, TV, state of the art “infotainment” system, and private bathroom with shower. 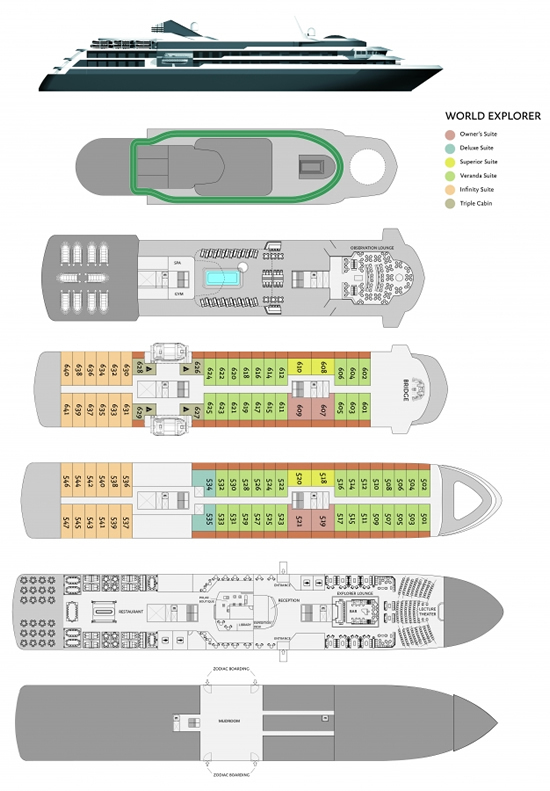 Approximately 215 square feet, with one double or two single beds, on Deck 5. A 55 square foot walk-out balcony, sitting area with sofa, refrigerator, TV, state of the art “infotainment” system, and private bathroom with shower. Approximately 270 square feet, one double or two single beds, on Deck 5. A floor-to-ceiling glass Juliet balcony, sitting area with sofa, refrigerator, TV, state of the art “infotainment” system, and private bathroom with shower. Initial deposit is $1500 per person, a second installment of $5,000 per person is due on May 9, 2019, with final payment due September 9, 2019. Optional gratuities are not included in the program fare. You may at your discretion provide gratuities at the end of the cruise. Single Supplement is 70% of double occupancy price, for Veranda and Infinity Suites. 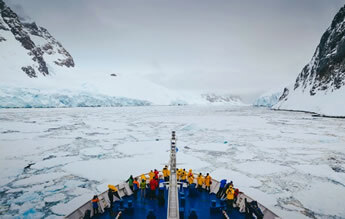 Due to the weather dependency of this program, Quark Expeditions (the cruise line) advises all guests to book changeable airlines tickets along with cancellation and interruption insurance to assist with additional airline change fees. We also advise all guests to have flexible travel arrangements upon disembarkation of the voyage in case delays arise. Early booking rate reflects a discount of $3,000 per person if booked prior to July 1, 2019.